Because of Madalene: Christmas in February! My friend Lea surprised me on V-Day with a creamy, decadent spread called Cookie Butter! Have you heard of this? 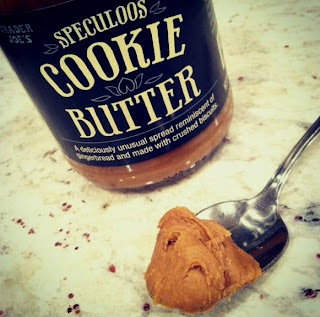 She found it at Trader Joe's (they've outdone themselves, again!). They usually only carry it during the holidays, but some of their stores still have it... you just have to search a bit. When you do find this, stock up because it has a shelf life of a year. So, this should keep you busy until the holidays roll around, again. This Christmas smelling gingerbread spread tastes incredible on pretty much anything and makes them tastes richer and nuttier. So far I've put it on cookies, crackers and have eaten it right off the spoon. But they also claim it tastes amazing on pancakes, celery sticks, pretzels, etc. I can't wait to explore more with this food phenomenon. Remember these? 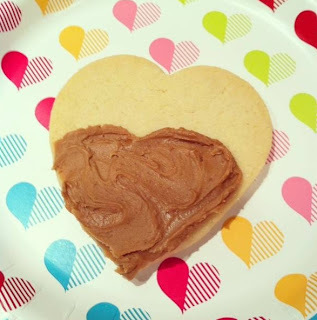 Instead of the chocolate, I simply replaced it with cookie butter. Too good! have you swirled it with Nutella yet ? I can't even imagine how freakin' good that would be !! !